God's Word or Motivational Mantra? Does it ever feel as though Bible verses have been repeated so often they have lost their meaning? Like a game of Bible Mad Libs where bits and pieces of Scripture are pulled and patched together to fit a fill-in-the-blank narrative that stays from what God really said. From God's great love to his plan and purpose for you, this book will shine new light on the most misused scriptures, placing each verse back into the context it was written so that you can experience the fullness of all the great truths God offers for your comfort, encouragement, and spiritual growth. 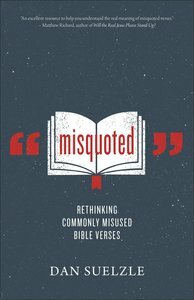 About "Misquoted: 20 Things the Bible Doesn't Actually Say"